Call for Participation: The 8th edition of Minesweepers competition will take place in conjunction with the 2019 IEEE/RSJ International Conference on Intelligent Robots and Systems (IROS 2019) in Macau, CHina in November 3-8, 2019. 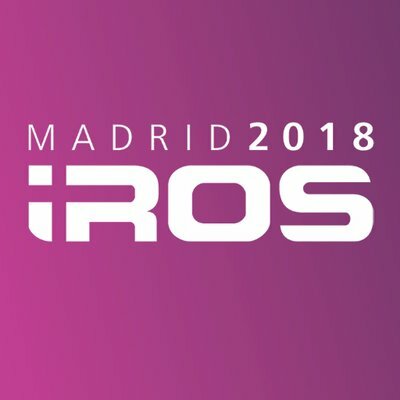 Call for Participation: The 7th edition of Minesweepers competition will take place in conjunction with the 2018 IEEE/RSJ International Conference on Intelligent Robots and Systems (IROS 2018) in the beautiful city of Madrid, Spain in October 2-5, 2018. . Registration due date is May 31, 2018. Dr. Alaa Khamis, IEEE RAS Egypt Chapter founder and chair gave a talk entitled "AI: A Key Enabler for Sustainable Development Goals" at BioVision 2018 - Bibliotheca Alexandrina in April 22, 2018. Slides are available at: SlideShare. 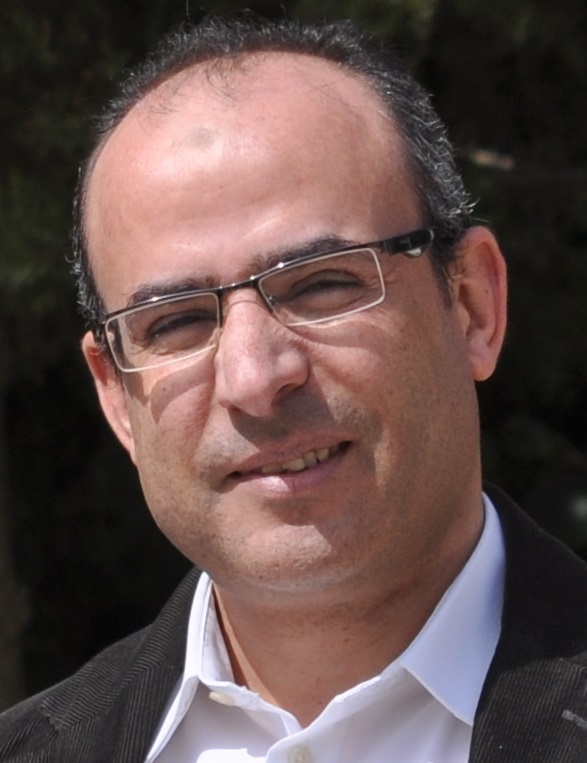 Dr. Alaa Khamis, IEEE RAS Egypt Chapter founder and chair published a paper entitled "Artificial Intelligence and Machine Learning: Promises and Limitations". 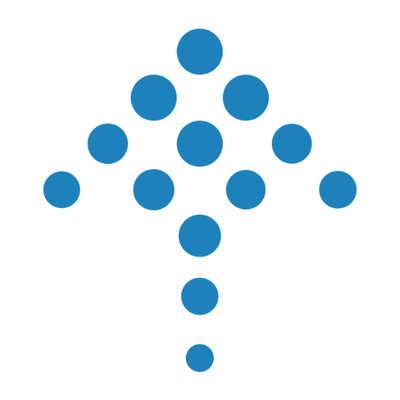 Paper is available at: Dataconomy Media. Speaker: Professor Oussama Khatib, Professor of Computer Science at Stanford University. Call for Papers: IEEE RAS Egypt Chapter is technically sponsoring 28th IEEE International Conference on Microelectronics that takes place at Nile University in December 17-20, 2016, Cairo , Egypt. 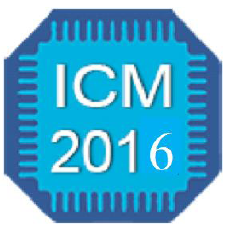 Paper submission deadline is June 30, 2016 . IEEE RAS Egypt organizes The Second International Workshop on Recent Advances in Robotics and Sensor Technology for Humanitarian Demining and Counter-IEDs (RST 2016) will take place in October 27-30, 2016 at Zewail City of Science and Technology, Egypt. Paper Submission Deadline: July 18, 2016. 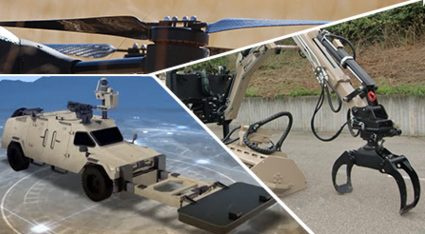 Unmanned Ground Vehicles, April 22, 2016 at 8:00PM (Cairo Time) by Eng. Ahmed Hussein, Intelligent Systems Lab (LSI), Universidad Carlos III de Madrid, Spain. Unmanned Aerial Vehicles, May 8, 2016 at 8:00PM (Cairo Time) by Eng. Amr Nagaty, Aviya Aerospace Systems, Canada. Robot Operating System (ROS), May 13, 2016 at 8:00PM (Cairo Time) by Eng. Muhammad Aly, InnoVision Systems, Egypt. Landmine Detection, May 20, 2016 at 8:00PM (Cairo Time) by Dr. Hisham El-Sherif, German University in Cairo (GUC), Egypt. Wireless Communication for Teleoperated/Autonomous Vehicles, May 27, 2016 at 8:00PM (Cairo Time) by Dr. Ahmed Madian, Nile University, Egypt. To register, please visit: https://www.flipcause.com/secure/cause_pdetails/NjkzNA. Call for Participation: The fith edition of the competition is hosted by Zewail City of Science and Technology in October 27-30, 2016. Registration due date is May 15, 2016. IEEE RAS Egypt Chapter organized Robo Camp Ismailia in the Egyptian Engineers Syndicate in Ismailia City in February 2 - February 3 2016. Photos of the event. 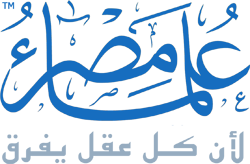 The 2nd International Conference on Advanced Intelligent Systems and Informatics (AISI’16) will take place in October 24-26, 2016 in Cairo, Egypt. IEEE RAS Egypt is the technical co-sponsor of this conference. Paper Submission Deadline: April 30, 2016. Chapter chair will give a webinar entitled “Shaping the Future of Robotics and Automation in Egypt” organized by Egypt Scholars. For more information and to register. A Google map contains information about different formal and informal education programs related to robotics and automation in Egypt and other Arab countries is now available. Information about research centres/groups and start-ups and SMEs is also available. 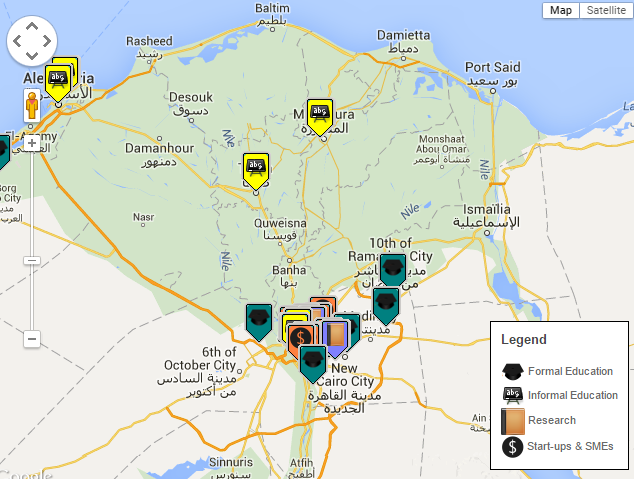 The map is created based on data collected and categorized by Dr. Alaa Khamis, chapter chair. 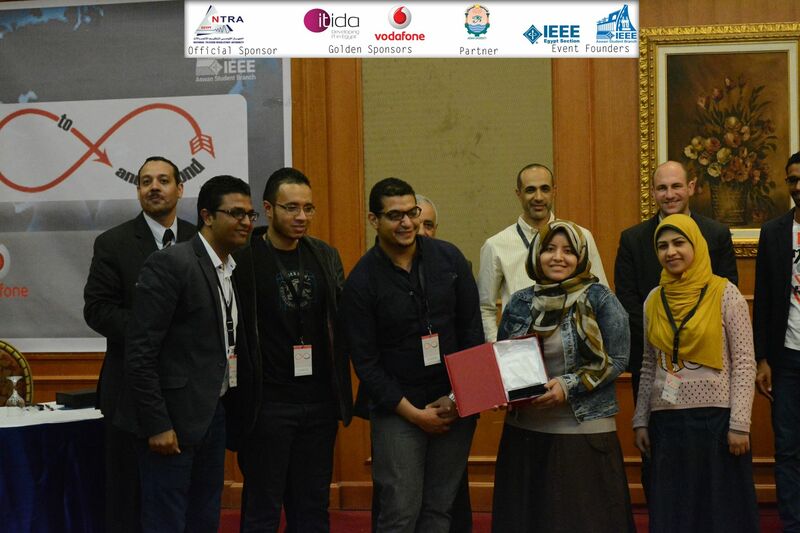 IEEE RAS Egypt Chapter receives the 2015 IEEE RAS Chapter of the Year award at ICRA 2015 . Congratulations to Egypt! 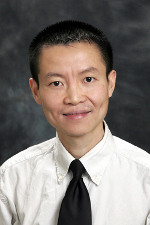 Speaker: Dr. Howard Li, Associate Professor in the Department of Electrical and Computer Engineering and Director of COllaboration Based Robotics and Automations (COBRA) research group at University of New Brunswick, Canada. This talk has been delivered as part of Robotics and AI Track at The International Conference on Industry Academia Collaboration (IAC2015) technically sponsored by IEEE RAS Egypt Chapter. 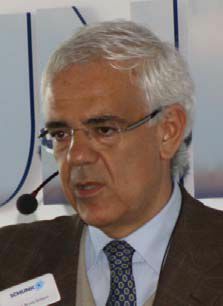 Speaker: Dr. Pascual Marqués is the Founder and President of Marques Aviation Ltd in the United Kingdom and the International Director (UK) of Unmanned Vehicle University. This talk has been delivered as part of Robotics and AI Track at The International Conference on Industry Academia Collaboration (IAC2015) technically sponsored by IEEE RAS Egypt Chapter. 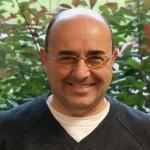 Speaker: Dr. Alaa Khamis is Associate Professor at Suez University, Senior Research Scientist at Vestec, Inc. Canada and the Founder and Chair of IEEE RAS Egypt Chapter. This talk has been delivered as part of Robotics and AI Track at The International Conference on Industry Academia Collaboration (IAC2015) technically sponsored by IEEE RAS Egypt Chapter. Call for Papers: Workshop on Recent Advanced on Robotics and Sensor Technology for Humanitarian Demining in The 6th International Conference on Computing and Informatics in Northern Chile (INFONOR-Chile 2015). IEEE RAS Egypt Chapter chair is the co-organizer of this workshop. Paper submission deadline is March 1, 2015. Call for Participation: The fourth edition of competition is organized Universidad Catolica del Norte (Catholic University of the North) in conjunction with the 6th International Conference on Computing and Informatics in Northern Chile (INFONOR-Chile 2015). Registration due date is March 15, 2015. IEEE Robotics and Automation Society– Egypt Chapter is technically sponsoring The International Conference on Industry Academia Collaboration (IAC2015) that will take place in Fairmont Heliopolis, Cairo, Egypt in April 7-9, 2014. The Robotics Technology and Artificial Intelligence Track of IAC2015 is co-chaired by IEEE RAS Egypt Chapter chair and vice-chair. 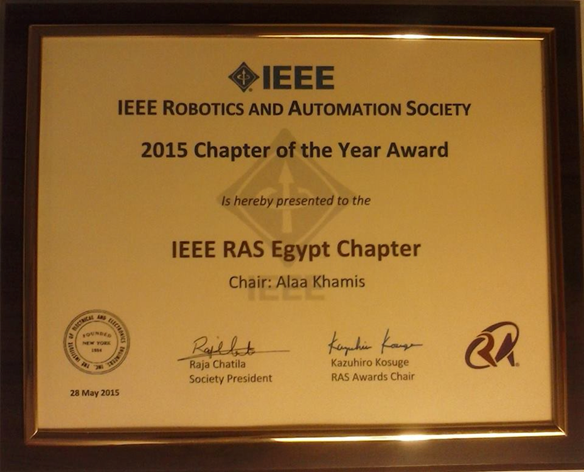 IEEE Robotics and Automation Society - Egypt Chapter has been selected as the recipient of the IEEE RAS Chapter of the Year Award for 2015. Congratulations to Egypt! IEEE RAS Egypt Chapter is technically sponsoring CSCC2015 that will take place in Zakynthos Island, Greece, July 16-20, 2015. Paper submission deadline: May 16, 2015. IEEE RAS Egypt Chapter is technically sponsoring Special Session On Robot Vision and Vision-based Blind Assistive Technologies at The 2nd International Conference on Advanced Machine Learning Technologies and Applications (AMLTA14). Deadline for paper submission is June 30th, 2014. Call for Participation: The third edition of competition is organized in September 1-3, 2014 by Institute for Systems and Robotics, University of Coimbra under the auspices of IEEE RAS Special Interest Group on Humanitarian Technology (RAS-SIGHT). Registration due date is May 15, 2014. 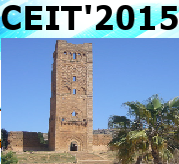 Keynote speech given by Dr. Ahmad Taher Azar, Educational Chair of IEEE RAS Egypt chapter at International Conference on Control, Engineering & Information Technology (CEIT’14), March 22-25, Tunisia. 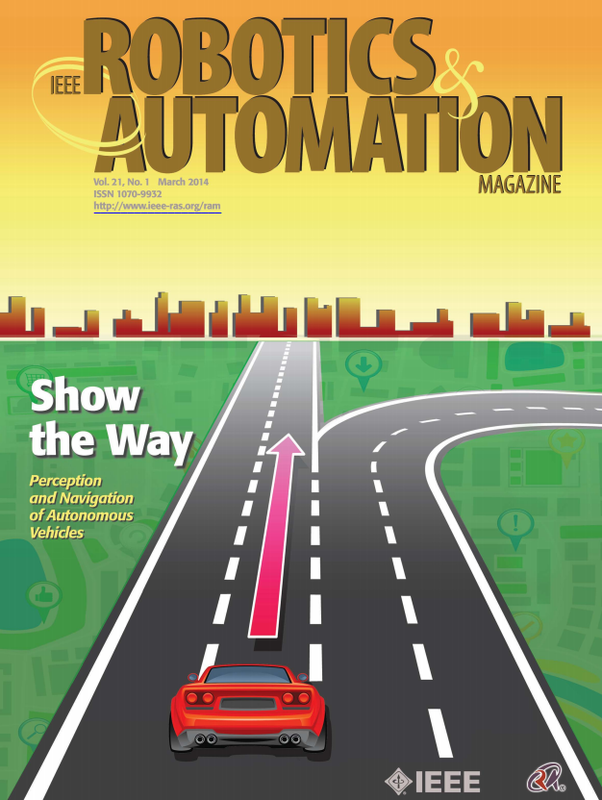 IEEE RAS Egypt Chapter’s competition Minesweepers: Towards a Landmine-free World has been featured in pages 83-84 of the IEEE Robotics and Automation Magazine. 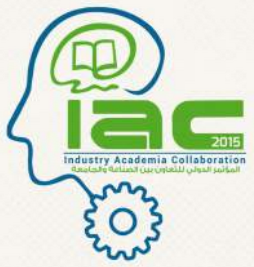 IEEE Robotics and Automation Society– Egypt Chapter chair Dr. Alaa Khamis gave a keynote speech about role of cooperation in multi-robot systems in The International Conference on Industry Academia Collaboration (IAC2014). 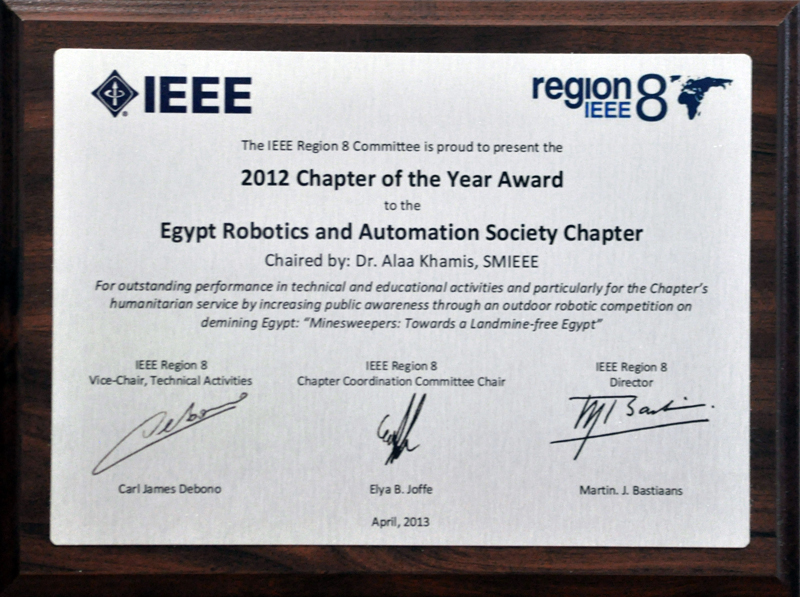 IEEE Robotics and Automation Society– Egypt Chapter has been selected as best chapter in Egypt in the closing event of 2013 activities of IEEE Egypt Section. Our chapter is also the winner of the 2012 Chapter of the Year Award in IEEE Region 8 (Europe, Middle East and Africa). 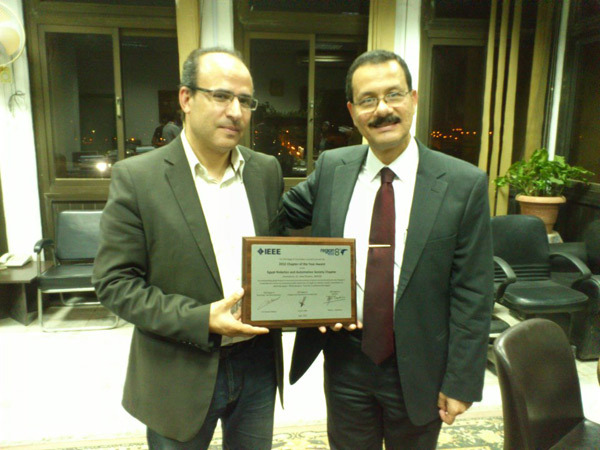 Jose Roberto De Marca, IEEE President and Costas Stasopoulos, Region 8 President Elect visit Egypt in January 22nd-26th, 2014. IEEE RAS Egypt Chapter is participating in a meeting with the IEEE delegates and IEEE key officers in Egypt Section. Our recent activities to serve our society will be presented in this meeting. 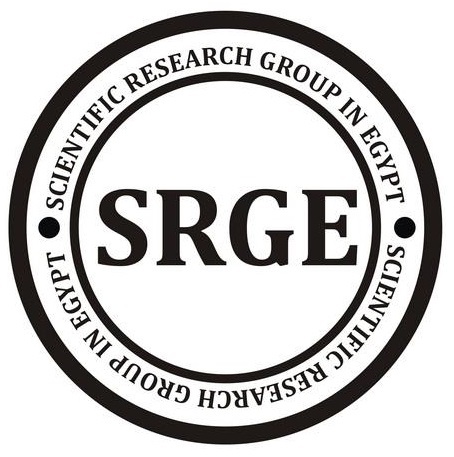 IEEE RAS Egypt Chapter is technically sponsoring the International Workshop on Research and Education in Mechatronics (REM 2014) that will take place in 9-11 September 2014, Elgouna, Egypt. Congratulations for all the teams and See you in Minesweepers 2014. Photos and videos of the events are available here. 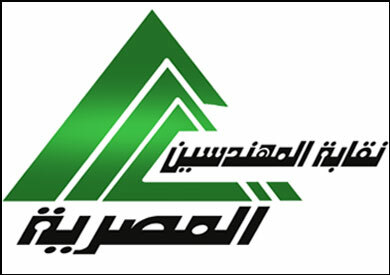 IEEE Robotics and Automation Society– Egypt Chapter is technically sponsoring The International Conference on Industry Academia Collaboration (IAC2014) that will take place in Fairmont Heliopolis, Cairo, Egypt in March 3-5, 2014. 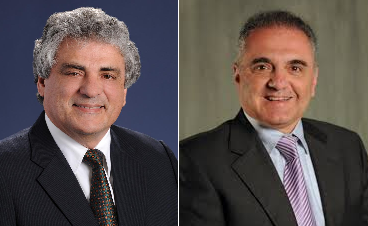 The Robotics Technology and Artificial Intelligence Track of IAC2014 is co-chaired by IEEE RAS Egypt Chapter chair and vice-chair. 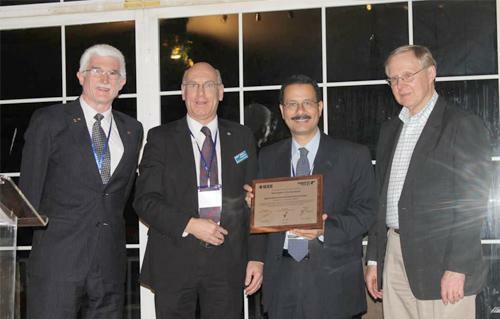 IEEE Robotics and Automation Society– Egypt Chapter is technically sponsoring The 2013 IEEE International Conference on Electronics, Circuits, and Systems (IEEE ICECS 2013) that will take place in December 9-12, 2013 in Abu Dhabi, UAE. The conference was supposed to take place in Cairo but it has been moved to Abu Dhabi due to the political instability in Egypt. Minesweepers: Towards a Landmine-Free World orientation day will take place in Thursday, June 27, 2013 at German University in Cairo. For more information, visit our facebook page. 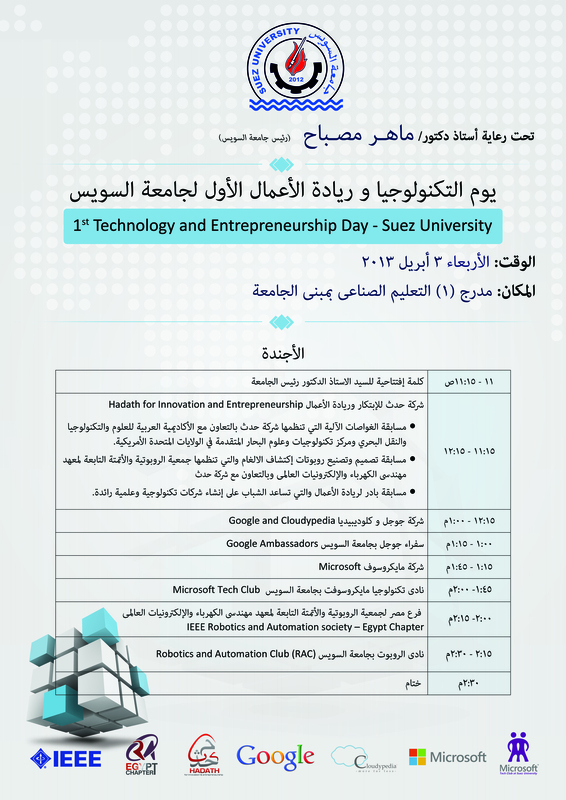 IEEE Robotics and Automation Society – Egypt Chapter organizes the first Technology and Entrepreneurship Day at Suez University in collaboration with Hadath for Innovation and Entrepreneurship, Google and Microsoft. 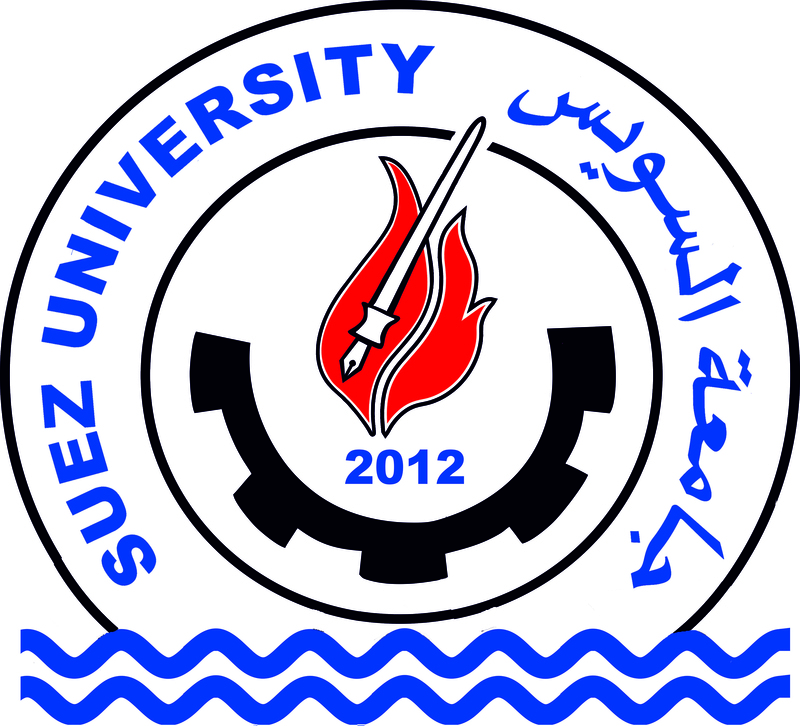 The event takes place on Wednesday April 3, 2013 from 11:00AM-2:30PM at Hall-1 at Suez University. IEEE Robotics and Automation Society – Egypt Chapter in collaboration with Hadath for Innovation and Entrepreneurship organizes a number of orientation sessions for Minesweepers: Towards a Landmine-Free World at number of Egyptian universities. Ain Shams University Session is in March 28, 2013. Cairo University session is in April 11, 2013. 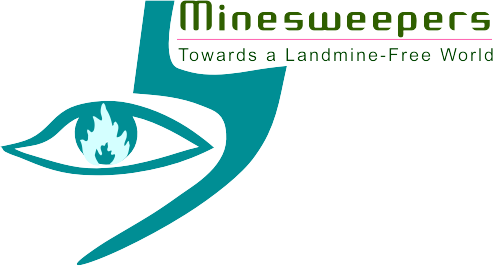 In order to foster robotics research and its applications in the area of humanitarian demining in the world, the IEEE Robotics and Automation Society – Egypt Chapter organizes Minesweepers: Towards a Landmine-free World as the first international outdoor robotic competition on humanitarian demining. It aims at raising the public awareness of the seriousness of the landmines and UXOs contamination and the role of science and technology in solving this problem and motivates professors, engineers and students working on innovative solutions for this serious problem.A special version of the competition entitled Junior Minesweepers is dedicated to primary and secondary school students. IEEE RAS - Egypt Chapter chair Dr. Alaa Khamis gave a talk entitled "Robotics between Fact and Fiction" in the orientation session of ROV competition that took place at Ain Shams University. 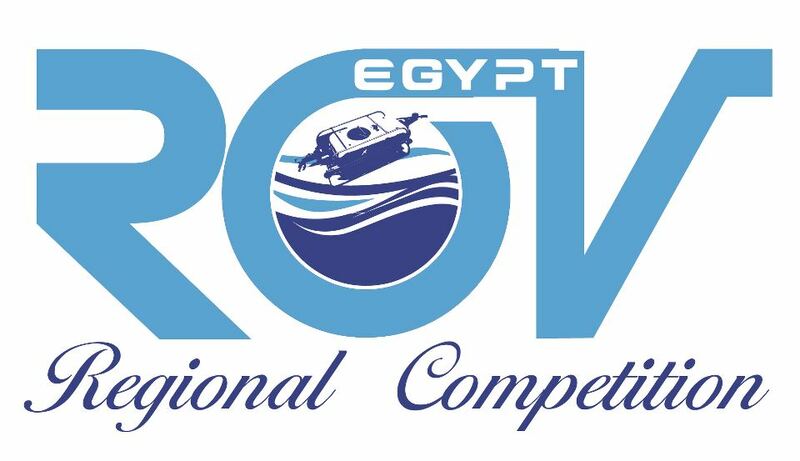 IEEE Robotics and Automation – Egypt chapter is the academic partner for the 2013 ROV EGYPT Regional Competition. ROV, or Remotely Operated Vehicle, is a tethered underwater robot used for many purposes across many industries that operate underwater. ROVs can perform many specialized tasks in industries such as oil and gas, commercial shipping, salvage, ship husbandry, potable water, ocean engineering, video production, scientific research and others. The IEEE RAS Egypt chapter technically sponsors the competition and will provide trophies and certificates of honor for the winners. 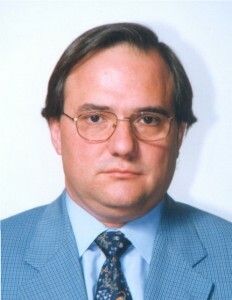 Speaker: Professor Bruno Siciliano, Professor of Control and Robotics, Director of the PRISMA Lab in the Department of Computer and Systems Engineering at University of Naples Federico II and Past-President of the IEEE Robotics and Automation Society. Where: Auditorium of Nile University in Smart Village. IEEE RAS - Egypt Chapter organizes a seminar about Cooperative Multirobot Systems in Faculty of Computers and Information Science at Ain Shams University .This seminar is prepared and given by Dr. Alaa Khamis, chapter founder and chair. 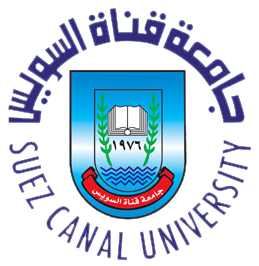 IEEE RAS - Egypt Chapter organizes a free intenstive course entitled "Optimization with Engineering Applications" at Suez Canal University.The course is prepared and given by Dr. Alaa Khamis, chapter founder and chair. [posted November 1, 2012]. IEEE Distinguished Lecture: Pico-Satellites for Education and Research in Networked Space Systems, given by Prof. Dr. Klaus Schilling, Julius-Maximilians-University Würzburg, Germany in October 11, 2012 in New Cairo CIty. This lecture has been sponsored by IEEE Distinguished Lectures Program fund offered to IEEE RAS - Egypt Chapter. IEEE RAS - Egypt Chapter organized a talk about Social Roboitcs given at Germany University in Cairo by Prof. Dr. Miguel A. Salichs, Director of RoboticsLab, Department of Systems Engineering and Automation, Carlos III University of Madrid, Spain..
Panel Session: Robotics Education: From Schools to Academia and Industry, International Conference on Engineering and Technology (ICET 2012), German University in Cairo, Egypt. 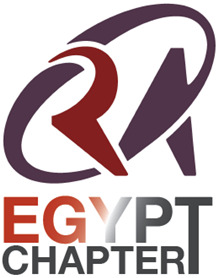 IEEE RAS Egypt Chapter supports the EgyptianWorld Robotics Olympiad. This competition is divided into 3 categories (Regular, Open and Soccer). This year the theme of the competition was "Robots Connecting People". The number of overall winners was 7 seven teams from all categories who are going to present Egypt in the International finals. 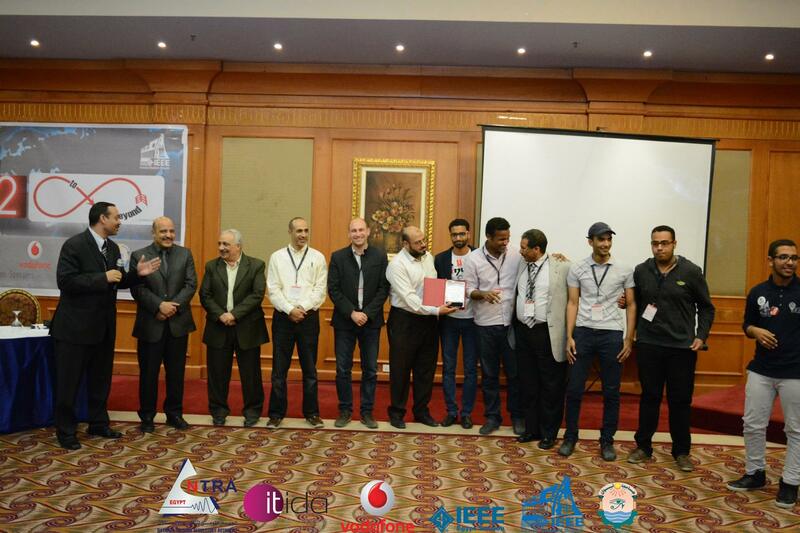 IEEE RAS Egypt offered awards to the winning teams. IEEE RAS Egypt Chapter is organizing a robotic competition "Minesweepers: Towards a Landmine-Free Egypt" that aims at fostering robotics research and its applications in the area of humanitarian demining in Egypt. As Egypt has been listed as the country most contaminated by landmines in the world with an estimate of approximately 23,000,000 landmines, this competition will raise the public awareness of the role of science and technology in solving this problem and will motivate professors, engineers and students working in this pertinent area of national importance. In Minesweepers, 97 participating teams will construct teleoperated or autonomous robots that should be able to search for underground and aboveground anti-personnel mines and produce a map of the detected mines. The robots have to be able to navigate through rough terrain that mimics a real minefield. 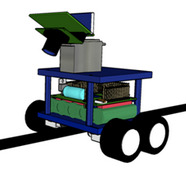 The chapter broadcasts a set of Webinars (Web Seminars) to help the participating teams in constructing the demining robots covering different related topics such as locomotion systems, environment perception, robot navigation and wireless communication. Orientation sessions at participating universities will also be offered. The competition is partially sponsored and will be hosted this year at the German University in Cairo. Executive Secretariat for the Demining and Development of the North West Coast, Egyptian Ministry of International Cooperation provide in-kind support for the competition. Minesweepers: Towards a Landmine-Free Egypt is held in conjunction with the Egyptian Engineering Day 2012. IEEE RAS Egypt Chapter is offering a free intensive course about "How to Build a Real Robot" at different Egyptian universities to the all interested students from different majors. The objective of this course is to teach students how to build a real robot that can achieve intelligent connection between perception and action. Without assuming any prior knowledge of robotics, the course provides an introduction to the key issues involved in the development of real robots such as locomotion systems, sensing the world, microcontrollers, etc. This is a lecture-lab-project course in which topics are presented by the instructor supported by a set of laboratory sessions given by teaching assistants. A team-based competition project is integrated as an essential part of the course. This project helps students to get hands-on experience in designing and implementing robotic systems. The project is a robotic competition entitled "NileBot". The objective of this competition is to design a robot that can follow a meandering path that mimics Nile river path from Aswan to Cairo accurately in the least amount of time. 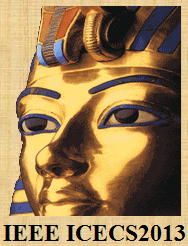 The robot will be placed at a pre-assigned starting point (Aswan) and may be started by hand as directed by the judge. Once started your robot must navigate along a black line as quickly as possible. This robot must have two important aspects: the capacity of detecting and following-up the path and the rapidity with which the maneuvers are carried out. This course has been offered to 78 students at three Egyptian universities. IEEE RAS Egypt Chapter initiated Robotics and Autonomous Systems Talks (RASTalks), a series of seminars that provide a communication point for undergraduate and postgraduate students to share and learn about others research ideas in an informal manner. These informal talks are widely open to all students interested in robotics and automation. Talks are at a level that could be understood by a non-specialist. RASTalks started at German University in Cairo and will be repeated at other Egyptian universities. IEEE RAS Egypt Chapter is organizing the International Conference on Engineering and Technology (ICET 2012) in conjunction with the German University in Cairo (GUC) 10th year anniversary in the beautiful city of Cairo, Egypt. ICET aims at providing a platform for researchers, engineers, academics and industrial professionals to present their recent research work and to explore future trends in various areas of engineering and technology. IEEE RAS Egypt Chapter sponsors Special Session and Competition on Robot Vision in the International Conference on Advanced Machine Learning Technologies and Applications (AMLTA 2012), Cairo, Egypt 8th-10thDec. 2012. IEEE RAS Egypt Chapter organized a talk about Networked Robot System given by Prof. Dr. rer. nat Klaus Schilling, Professor and Chair of Robotics and Telematics Lab, Julius-Maximilians-University Wurzburg, Germany and Consulting Professor at Stanford University, Department of Aeronautics and Astronautics, USA.